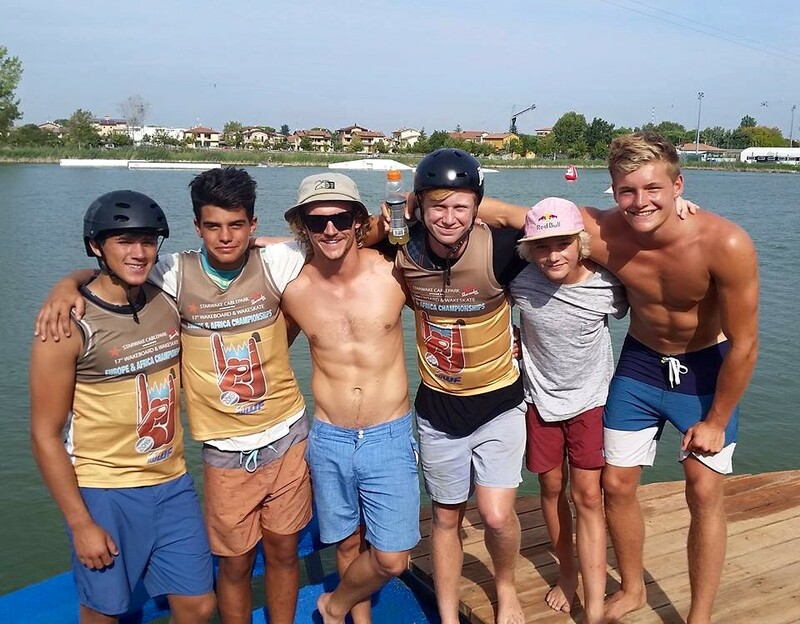 About 2 weeks ago we headed out to Italy with the rest of the British Team for the 17th Cable Wakeboard Europeans. We arrived at the cable park after a pretty fun filled trip and didn’t waste any time getting straight out on the water. Our first ride was super fun and I managed to put down a few grabbed double flips and some air tricks. A few days on we had some team training sessions where we managed to land a few tricks we haven’t landed in a while. Before we knew it the competition was under way. We had some good results in the first few days, then it was our time to shine. We all had hard heats for the qualifiers as everyone was riding so good. Liam managed to put down two pretty clean runs including his double flip and s mobe which secured him the 2nd place and top 2 went through to semis so made it through. Ryan competed and also managed to make it through to the semis after putting down 2 good runs. The next day we had semis and the pressure was on. The semis heats were insane which meant we had to put down some good runs to make it through. We went out and landed our first runs which managed to secured our places in the final, and then we had our 2nd runs to go out and use as practice. Later that day it was finals time. We went out for our runs feeling pretty chilled but focused and we both put down a pretty hard run. This ended up putting Liam in 4th place after Ryan went out to take the 3rd spot. Lam tried to step up on his run by adding in a mobe 5 between the top corners but unfortunately it wasn’t enough and he went away happily with the 4th spot and Ryan took the 3rd. We were both extremely pleased with our results especially Liam in his first year of Junior Men and we’d like to say well done to the other boys who took podium positions. Ariano (2nd) and Liam (1st). We’d also like to thank Ck and our Mum for looking after us out there and also to our sponsors, Mystic, Ronix, Extreme, JBSki and United Wakers!